Chairman Darragh MacAnthony (left) at the Posh press conference with new manager Grant McCann. Photo: Joe Dent/theposh.com. Peterborough United chairman Darragh MacAnthony speaks eloquently, at length, without notes, but with plenty of passion. He’s a master of the press conference. He’s a fine ambassador for the club. On these occasions, it’s not difficult to see how he trained thousands of salesmen into skilled operators capable of making his company millions. It’s not difficult to see how he would charm prospective managers into working for him. The top table at the Posh press conference, from left, David Farrell, Darragh MacAnthony, Grant McCann, Barry Fry and Mark Tyler. Photo: Joe Dent/theposh.com. MacAnthony is also quick-witted, straight-talking and always certain to defend his record as Posh chairman, as well as take public umbrage when he feels slighted. The chairman put it all out there today (May 16) at a high noon press conference. There was no subject matter in the press release confirming the conference, but Grant McCann’s revelation as manager surprised no-one, even during a 15-minute MacAnthony pre-amble which took place with just he and Barry Fry on the stage (surely Barry isn’t going to be manager mused one onlooker?). 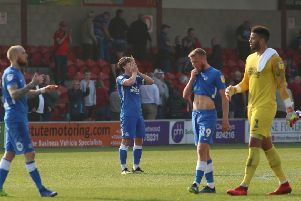 Much like the majority of Posh fans, MacAnthony revealed it had been a tough year, one that had needed the love and support of Fry, and then been saved by Grant McCann’s rise to top of the management food chain. Fancy that. The best man for the job 12 months ago was still the best man for the job now. It’s been a wasted year, but following an unpopular, de-stabilising presence like Graham Westley will most probably work in McCann’s favour. The chairman is cleary still sore about recent criticisms of his Posh stewardship, but at least he only swore once (and quickly apologised) on the live club feed. He wrongly assumed innocent questions about his new manager’s influence on the old one and his new manager’s influence on the club’s recently-revealed retained list were loaded with dynamite ready to explode with a dodgy answer. They weren’t. McCann is a popular choice in the media. He’s courteous, he’s honest and he’s a Posh fan. We don’t ask for a lot else. Those qualities will be enough to give him a far longer honeymoon period than, say, Steve Cotterill. McCann was merely being given the opportunity to distance himself from previous regimes, but he’s far too much of a gent to knock his predecessors. McCann said little, but Fry was seen to shake his head when the question was asked about the new manager’s ability to rein in Westley’s weirdly random though process. McCann wears a serious look. He barely smiled during his time on stage, but personal pride in his appointment was obvious. His preferred look ensures he isn’t seen to gloat and he will never be seen as arrogant. The 36 year-old new boss speaks with a soft Irish accent, but don’t be fooled into thinking that will translate into him being a soft touch. McCann was a cultured footballer, but he also picked up seven red cards in his career. I still wince at the tackle against Notts County a few years back that sparked an all-out scrap on both benches. McCann has a hard streak which he will need in the murky world he’s now entered. ‘Great football with an edge,” was MacAnthony’s prediction on the football McCann will promote. He could just as easily have been described McCann’s playing career. McCann made it clear he will not shirk tough decisions. He’s already had a hand in retained lists that always involve the departure of friends and the signing of Hayden White, also announced today, hints at more tough-talking to come. White is a right-back, the same position as McCann’s fellow Northern Irishman Michael Smith. Nonetheless Smith is part of a squad that will welcome McCann’s appointment with open arms. Several tweeted their approval as soon as the news broke. Approval will also be granted to the appointments of club legends Dave Farrell and Mark Tyler to help McCann. But the the arrival of an experienced assistant manager to help McCann is probably even more important.